Q: Why is Arthrex transitioning to GS1 standards? A: Arthrex is dedicated to the health care initiative with implementing GS1 standards to establish unique identifiers for health care locations products and services. Q: When will Arthrex transition to GS1 standards? A: In March 2018, Arthrex will start transitioning to GS1 standards. Q: Will Arthrex switch from HIBC to GS1 barcode in all products at the same time? A: We will be transitioning to solely using GS1 GTIN for Unique Device Identification (UDI). Q: When will the rest of the product families be implemented? A: The cadence of product family introduction will be gradual over an 18-month period. Q: Does the GS1-128 linear barcode and 2D GS1 DataMatrix contain the same information? A: Both barcodes contain the GTIN and production identifiers. Q: Will GELS introduce loaners and kit sets? A: Yes. Loaners and kit sets will be introduced over the 18-month period. Q: How can I determine if my scanner can read 2D barcodes? A: The best way to determine if your scanner can read 2D barcodes is to reference the scanner specifications on the manufacturer’s website. Q: What are the packaging label changes? A: The content of our product labels is being rearranged for global consistency and usability. See below graphic for reference. Q: Will Redspot support both HIBC and GS1 barcodes? A: Yes. Both barcodes will be enabled. No reprinting or relabeling will be required. Q: What if I don’t switch to GS1 standards? A: You will still be able to order devices from our product catalog as you have done in the past. The only exception now is you will notice GTINs appearing on packaging slips in addition to catalog numbers. Q: Do the packaging label changes impact customers outside of United States? A: Yes. The labeling changes will impact customers globally. As mentioned, we will maintain the GS1-128 linear barcodes in all product labels. Q: What if I can’t find the Label Control Number (LCN)? A: Fill out the Contact Us form. Q: Where is the Human Readable Interpretation (HRI) GTIN? A: HRI is the information below, beside or above a barcode or tag which is encoded in the barcode or tag and represents the same characters as carried in the barcode or tag. The GTIN is found immediately following Application Identifier (01) in the HRI of the barcode. Q: I’m having a problem with the label. Who should I contact? A: If you are having issues, fill out the form within Contact Us. Q: What is the Unique Device Identifier (UDI)? 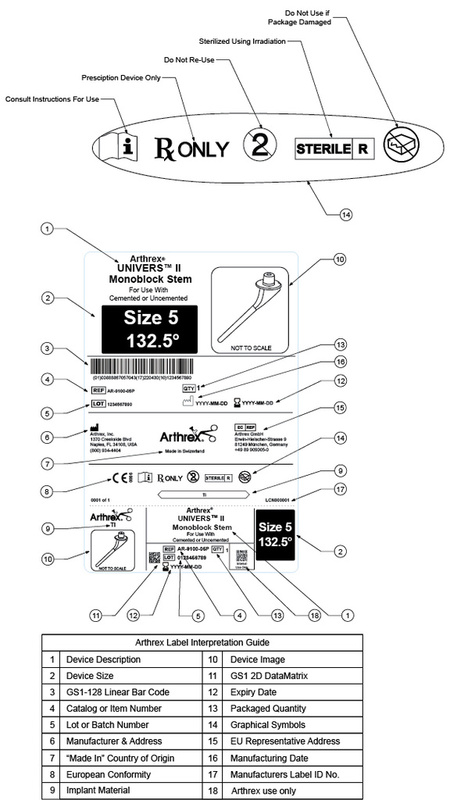 A: The unique device identifier is the Global Trade Item Number (GTIN), which can be found immediately following Application Identifier (01) in the HRI of the barcode. Q: Where can I obtain a GTIN for Arthrex products? A: Send a request by email to UDI_Global@arthrex.com. Q: How do I add a GTIN to an electronic health record? A: Go to www.fda.gov/UDI for guidance.